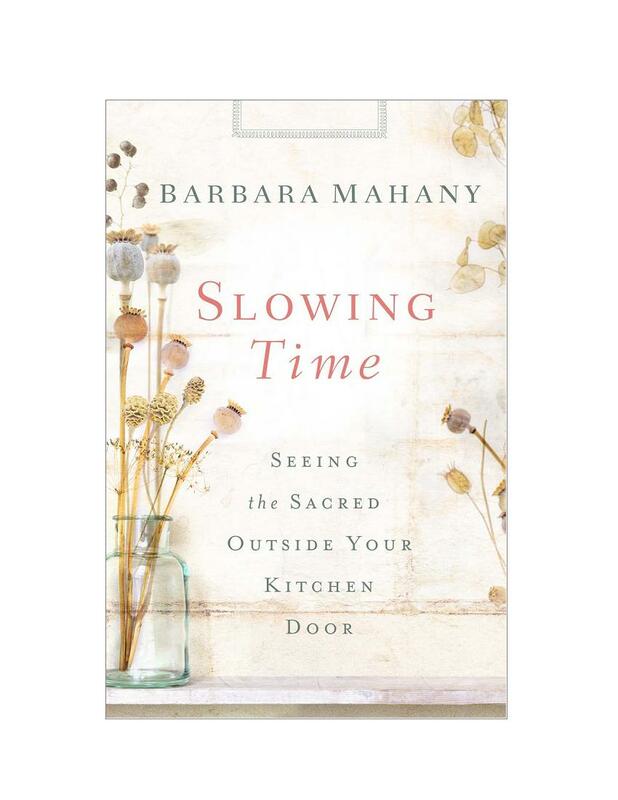 Slowing Time: Seeing the Sacred Outside Your Kitchen Door (Abingdon Press, October 2014) is a collection of meditations inviting readers to discern the divine in the ordinary moments of everyday and live an examined life where everything is a form of prayer. Barbara Mahany believes the sacred is all around, within finger’s reach—here to be gathered, culled, collected, through the simple yet complex art of paying attention, of savoring the moment, of cultivating stillness. Making room for God and illuminating the Godly specks in the everyday. Noticing the seen, revealing the unseen, and pinpointing the divine in both. The book sifts through the terrain of three particular landscapes where the author most often encounters the stirrings of the Divine: under heaven’s dome; on the front lines of the homefront; and in the unspooling of the seasons. The most essential prayer, often, is the life closely examined, held up to the light. By probing deeply the nooks and crannies of the home-front, the author points out that the reader need not venture far to find what matters most. And the questions stirred will linger, long after the page is turned. From the front pages of the Chicago Tribune, to her revered page-two columns, Barbara Mahany has opened her heart and told her stories and the stories of her family’s life that have drawn in thousands of readers for decades. She writes from the well of her Christian-Jewish marriage. Bracingly honest and heart-achingly daring, she explores the sacred mysteries with a voice, recognizable and clear. She is a sought-after speaker, and writing teacher. She lives in Wilmette, Illinois. Slowing Time named Foreword Reviews’ 2014 INDIEFAB Book of the Year Award Finalist. Spirituality & Practice named Slowing Time to its Best Books of 2014, Best Book of Wonder. –Katrina Kenison, author of The Gift of an Ordinary Day and Magical Journey: An Apprenticeship in Contentment. —Dr. Wendy Mogel is a clinical psychologist and the author of The Blessing of a Skinned Knee and The Blessing of a B Minus. –Rabbi Evan Moffic, Congregation Solel, Highland Park, IL, author and writer, Huffington Post, Beliefnet; named “one of 36 under 36” Jewish thinkers to watch in Chicago. —Debbie Blue, founding minister House of Mercy, St. Paul, MN; author Consider the Birds: A Provocative Guide to Birds of the Bible. –Lauren F. Winner, author of Girl Meets God. 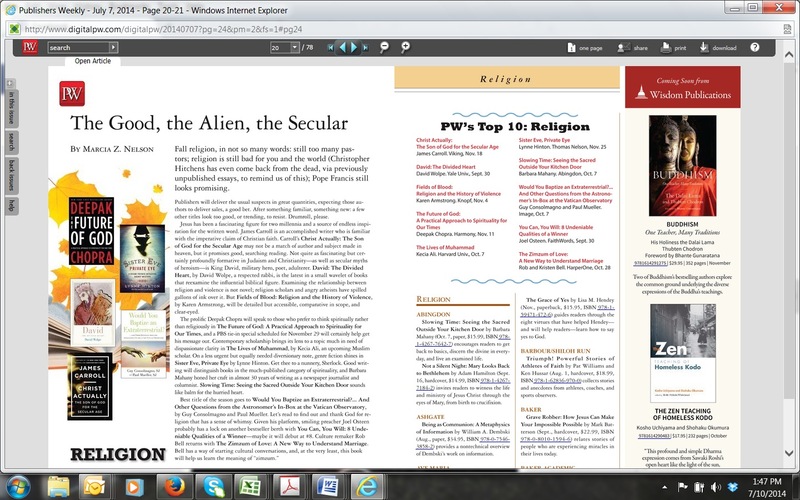 Peek at the Abingdon catalog and, perhaps, order here.